If you have any questions or want to enquire about dates, use our form to contact David Lygate or see their website for more information. This mews cottage in popular West Didsbury is a beautifully calm home for couples or a family. 129 has been perfectly crafted in both function and form, from the underfloor air source heating and shutters rescued from a French château, to the original local art and beautiful, obscure pieces from far and wide. David is an architect and every detail, piece and picture has been carefully found, commissioned or crafted. 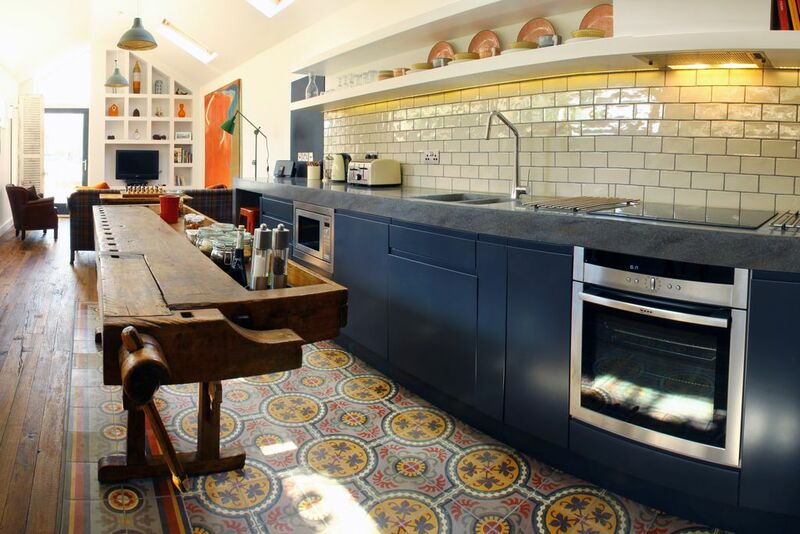 Cook in the sleek and well-equipped open-plan kitchen/living space, order delicious organic produce from the nearby deli, take coffee or tipples out to the terrace, set up a game of chess. Then, wind up the spiral staircase to the master bedroom; back downstairs, little ones love the Peter Pan wallpaper in the twin room. Games, music, DVDs, TVs upstairs and down… David has thought of everything. There’s free parking, the tram stops a few minutes down the road to take you right into town, you can walk to the river and parks and it’s a hop from the airport. Minimum stay: 2 nights. Check owners website for availability. £150 per night. Christmas & New Year £200 per night. The only disappointment was that Man United didn't beat Liverpool! The house was perfect for our needs - really liked the quirky or old furnishings with the modern. A great location which was convenient for the bus & tram up to town. We felt lucky to have the Craft market on Sunday & bought a couple of great pieces as well as the best eccles cakes. We'll definitely come back when we're up for the footie another time. Thank you! 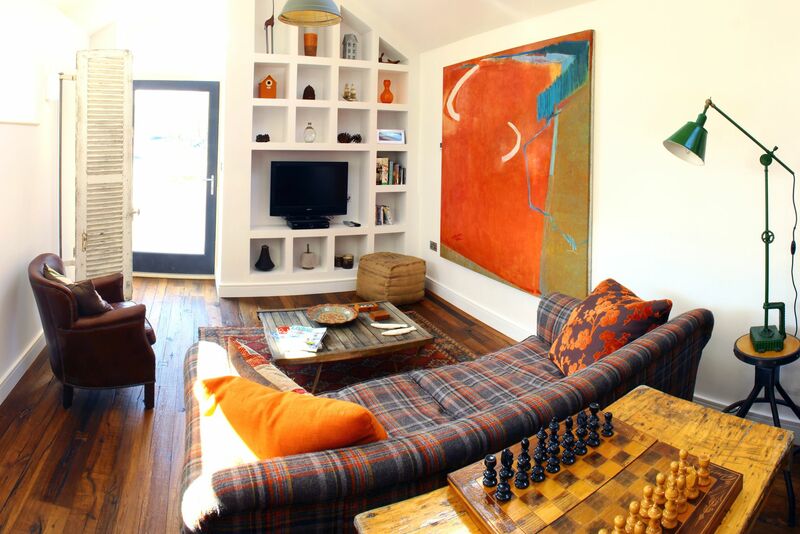 The cottage was perfect for a chilled break in trendy Didsbury - we were sorry to leave! 129 Didsbury is a treat of a place - the ultimate mixture of architecture and design - David has meticulously thought about every detail and you can tell - it's got a great calming feel, stop looking and get booking, you won't regret staying here! We had a lovely time staying in David's gorgeous house. His attention to detail with the fixtures and fittings and the fab styling made it a joy to come home to each day. A great location too with all the fun bars and restaurants on the Burton Road in Didsbury. 129 Didsbury is a wonderful place to stay and David an extraordinary caring host. We enjoyed a perfectly equipped cottage and all the beautiful details of style. If we ever come back to Manchester it is no question to chose this place again. Thank you very much for a wonderful stay! David's accommodation is outstanding. It combines stylish features, fixtures and fittings with a real sense of comfort. The standards are very high. The whole ambience of the place makes you relax as soon as you arrive. It is very well placed for West Didsbury with really convenient shopping, restaurants, pubs and so on. We were there for (mostly) working so really appreciated coming home to somewhere of such excellent quality where we were immediately able to relax. I should add that the kitchen is very well equipped.David has clearly put a lot of time and effort into being a great host. David's accommodation is outstanding. It combines stylish features, fixtures and fittings with a real sense of comfort. David takes personal care of the accommodation and the standards are very high. The beds, bed linen and towels are all good quality. The beds are very comfortable. The whole ambience makes you relax as soon as you arrive. It is very well placed for West Didsbury with really convenient shopping, restuarants, pubs and so on. We were there for (mostly) working so really appreciated coming home to somewhere of such excellent quality where we were immediately able to relax. Exceptionally well designed cottage conversion. High quality furnishings and thoughtfully equipped. Owner, David, could not have been more helpful in tailoring the cottage for our visit. Great Sunday brunch a few doors down the road at Thyme Out. We found it very conveniently located for visiting central Manchester - 10 min walk to tram. Didsbury itself was lovely with a village atmosphere and interesting shops and restaurants. You are our No1 host & our stay was a comfortable & restful one. You have been helpful & accommodating. Your cottage is hip & cool. We are looking forward to coming here again. Awesome few days, couldn’t fault the place. Lovely crisp linen, quiet, close to a fab area of West didsbury. Host couldnt have been more helpful. We will be back! Thank you David! We’ve had a fab stay at David’s for the last five weeks which have flown by. Beautiful, well equipped cottage with everything you need. 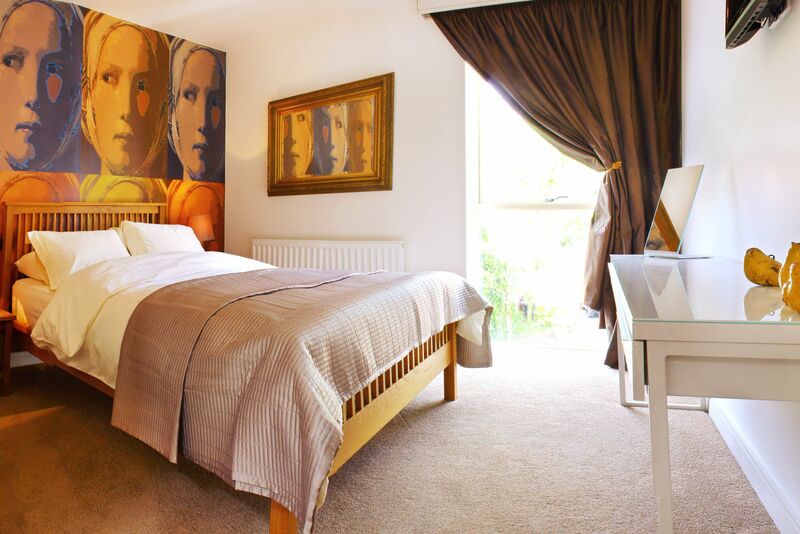 Brilliantly positioned in West Didsbury within walking distance of everything. Will highly recommend as great value. If there is a second series we will def be coming back! Thanks for everything. Our family thoroughly enjoyed our stay in this beautifully designed and finished home and enjoyed the convenience of the restaurants in the local village and easy access to Manchester. The cottage had everything we needed and lots more. David was very accommodating and on hand if we had any questions. We will happily return next time we are visiting Manchester. Highly recommended. We loved staying at 129Didsbury. The house was very nice, Didsbury was 'gezellig', and there was a lot to see in Manchester. Thank you David for your kind reception. A wonderful 3 night stay- this cottage is beautiful. It has been cleverly designed and furnished. Everything is to a very high standard. Yet it also feels very cosy and comfortable. On top of the quality of the accommodation is the warm welcome and friendly attention given by David, the owner. Its location is great in a quiet spot but close to the lovely restaurants and shops of West Didsbury. It all adds up to the perfect package and for us a really wonderful stay. My sister and I (Kiwis) stayed here for 9 nights in June on a recent trip to the UK. We had a wonderful time in Manchester much due to this amazing accommodation. David has designed and furbished a beautiful little mews cottage, perfectly equipped for self catering in every possible way. It has both modern and traditional elements, urban and rural touches in synch with its ancient origins and the most lovely atmosphere of relaxation and comfort. It is situated in a quiet, leafy area of interesting shops and restaurants. We found our host always charming, helpful, friendly and non intrusive. This is a lovely house, perfect for anyone who appreciates good design. It was a delight to stay in, there are loads of great places to eat locally, AND it's perfectly placed for visiting Manchester. Highly recommended. Superb design, comfortable and quiet, yet located in a vibrant urban village adjacent to all that Manchester can offer. We stayed 4 nights in this cosy and comfortable house. We wanted to stay longer and hope to have a reason to go back to Manchester and stay at 129 Didsbury. The location is excellent, easy access to the tram system, interesting independent shops just around the corner and off road parking. 129 is beautifully designed with very high spec furnishings and fittings. It feels homely, it is easy to settle in - everything works. There is a comprehensive range of cooking equipment, and spacious working surfaces. The owner lives nearby and is extremely helpful and concerned that guests are happy. West Didsbury has plenty of independent cafes, bars, restaurants and shops. A short tram ride gets you into central Manchester and all its big-city offerings: sports and National Football Museum, music venues, heaps of other museums, galleries, the Cathedral, Salford Quays, Media City and more. You could easily do a day trip to Liverpool, and it's only ten minutes from the airport. Some of Manchester's top restaurants are nearby & there is an eclectic mix of bars & independent shops. Combined with lovely parks and waterways makes this the ideal location for walk, run or even canoe trip! West Didsbury is a 10 minute taxi ride from the airport & only 4 miles from the city centre, we have a local tram stop so from the front door you can be there in 20 minutes via the tram. The network also gives easy access to Salford Quays & Media City. Manchester is steeped in history being the birthplace of the industrial revolution & has Britain's first Urban Heritage Park. We are also very fortunate to be surrounded by wonderful country houses & have a wealth of art galleries & museums. Manchester is home to two world famous football teams, the national football museum, Lancashire County Cricket, Sale Sharks Rugby Union, the aquatics centre with an olympic size pool & the Velodrome with world class cycling facilities. Manchester's family attractions cover all areas: art; sport; science & industry; social & natural history; transport; war; media (CBBC tour); lego; sealife; indoor sky diving; snow skiing; jump nation; rock climbing; or see the deer at Tatton or Lyme Park. An extensive road network, puts all of Manchester & the North West easily within your grasp for day trips to: Lake District, North Wales, Peak District, Yorkshire Dales, Liverpool, Chester, Leeds, York & Blackpool are all less than two hours away by car. Scottish-born David is understandably proud of what he has created with 129 Didsbury – it’s his real passion project. He has a great eye and his architecture is all about finding a sense of calm in his buildings. He’s a bit of a live wire though – marathons, ice climbing, sea kayaking, wild swimming in Salford Quays… He and his partner Amanda (and dog Barney) live on the other side of the courtyard - so he meets and greets and is on hand if needed. He honed his hospitality skills as a ski rep in the Italian Alps in his younger days.